The massive terrorist attack in Kumanovo is the latest provocation in the quest to create a Greater Albania and simultaneously sabotage Russia’s Balkan Stream project. 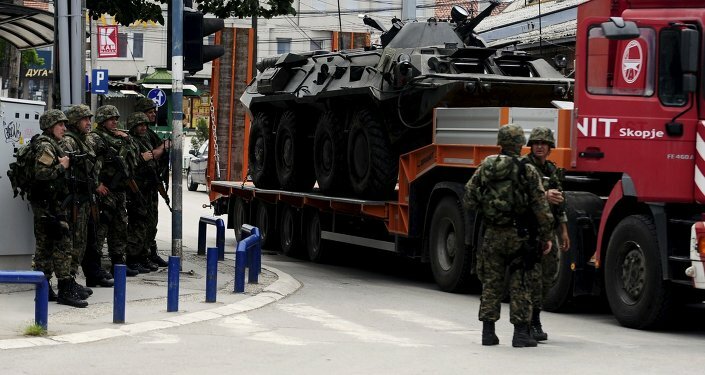 The Republic of Macedonia was rocked by a large-scale terrorist attack on Saturday when over 40 armed individuals fought with police for control of the city of Kumanovo close to the country’s capital. The attackers were from the so-called “Kosovo Liberation Army” (KLA), a former terrorist group that was thought to have been disbanded after NATO occupied the Serbian province, and Prime Minister Nikola Gruevski said that some of them had received their militant training in the Mideast. The combined carnage wounded 37 police officers and killed 8 of them, while ultimately eliminating 14 terrorists and leading to the capture of 30 others. The fighting has raised serious concern that the flailing Color Revolution attempt ongoing since January may desperately coordinate with the ethnically shaded Unconventional War, as both destabilizations are directed from abroad and have the shared objective of regime change. If they succeed in overthrowing the government, then the forces behind them can sabotage Russia’s Balkan Stream project and formalize the creation of Greater Albania. Democratically elected Prime Minister Nikola Gruevski and his government have been fending off a Color Revolution attempt since the beginning of the year, and thus far, they’ve been relatively successful in avoiding the “opposition’s” provocations to escalate the crisis. Zoran Zaev, the Color Revolutionary figurehead, was charged at the end of January with conspiring with an unnamed foreign government to stage a coup d’état, yet this hasn’t stopped him from continuing to call for regime change. His campaign has sought to cultivate and exploit youth grievances in order to acquire the illusion of critical mass needed to attract overt international (Western) support for his plot. Importantly, however, the two main Albanian opposition parties have refused to go along with Zaev’s conspiratorial actions and have continued to support democracy and the legitimately elected government. Their loyalty is exceptionally important because ethnic Albanians constitute over a fifth of the country’s population and largely inhabit the border regions with Albania and the occupied Serbian province of Kosovo, thus meaning that their defection to the regime change movement would be catastrophic not just for the government, but also for the country’s very existence. The main reason they support the authorities is because the government endows them with the best minority rights afforded anywhere in the world as a result of the 2001 Ohrid Agreement. They largely understand that their forced incorporation into Greater Albania would do away with these generous privileges and subordinate them to second-rate citizens in the irredentist state, thereby doing away with their former role as first-rate ones in multiethnic Macedonia. In fact, they may not even feel like citizens at all in a Greater Albania, since if Albanians in “Kosovo” are any indication, then hundreds of thousands of them may flee from their failed “state” and completely abandon it to the terrorist and criminal gangs that made it “independent” in the first place. This brings about the necessity in discussing the project for a Greater Albania, which Tirana threatened to bring about as recently as last month. Albanian Prime Minister Edi Rama warned that his country would “unite” with the Serbian province of Kosovo whether the EU supports such a move or not, calling the forthcoming annexation “inevitable and unquestionable”. In what Albania would like the world to believe was just a completely random occurrence, the dormant KLA terrorist group was suddenly revived and carried out what now appears in hindsight to have been a test-run terrorist attack late last month near Gosince. It should be clear at this point that the two pervious provocations are intimately interconnected with the catastrophe in Kumanovo, and that all three of them combine to form the war cry for a Greater Albania. But there’s an even larger international component at play here, and that’s the US’ obsession with derailing Russian-European energy cooperation via the Balkan Stream pipeline, the de-facto successor of South Stream. Envisioned as an expansion of Turkish Stream, it’s projected to carry Russian gas from Greece to South Stream’s former Serbian hub, critically passing through Macedonia en route. Accordingly, if Macedonia is thrown into chaos and/or its government is illegally removed, then Balkan Stream becomes a pipedream (pun intended) and would never get built, hence why the combined Color Revolution and Unconventional War have been unleashed on the geostrategic country. The destabilization in Macedonia is thus essentially a Western proxy war against Russia in the context of the New Cold War. Many in the foreign media are saying that the terrorist attacks could herald in a possible civil war between Albanian and Slavic Macedonians, but such an assessment is misleading, and in the case of Western reporting, purposely so. Most of the attackers were Macedonian citizens (the others being Albanian and “Kosovan”), but many of them received their highly specialized training in the Mideast, a euphemism meant to signify ISIL. Their adept and lethal handling of sniper rifles, explosives, and automatic weapons proves that they weren’t run-of-the-mill drug-trafficking thugs and lends convincing credence to this claim. Furthermore, these terrorists were professionals and were planning to carry out coordinated large-scale attacks against soft targets such as sporting events and shopping malls prior to their interception by the authorities, and they had already stockpiled loads of arms (many of which were consequently used against the police) in anticipation of this. 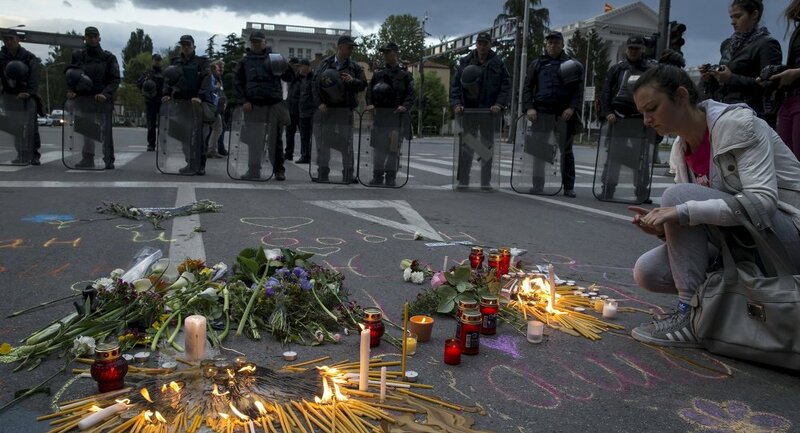 The revival of the KLA and its latest terrorist violence are meant to provoke Albanian Macedonians into abandoning the government and siding with the militant irredentists. The concept of Greater Albania is an emotionally charged tool designed to increase the country’s destabilization and consequently facilitate regime change in conjunction with the simultaneous Color Revolution attempt. It endeavors to craft the illusion of consensual acceptance by all Albanians, even though this clearly isn’t the case at all. In fact, it can be said that the resort to ethnically affiliated terrorism indicates desperation on the side of the external anti-Macedonian actors, since they recognize that this is the last option they have in trying to get the Albanians to turn against the government and instigate a racial and religious division of society. The conspirators wouldn’t utilize such extreme methods if they felt they could achieve their objectives in a simpler manner, such as through intelligence-front NGOs or by ‘legitimately’ winning them over to the side of the Color Revolutionaries. The violent, last-ditch effort to christen Greater Albania through a sea of killings testifies to the fortitude of Albanian Macedonians in heretofore resisting this tempting Fascist-era ideology, hence the need to export Wahhabist ISIL terrorists to this latest New Cold War theater in order to mangle Macedonia and break Russia’s Balkan Stream plans.